Let the treats begin! With this Single Sided 2 foot, Candy Rack display your customers will have easy access to their favorite treats like bulk wrapped candy, chips, cookies and crackers. This freestanding floor fixture includes four metal shelves of various depth sizes ranging from over six-inches to 12-inches deep. The l-shaped style legs keep this retail store fixture sturdy and dependable. Overall dimensions of this black rack are 24" wide by 48" tall. 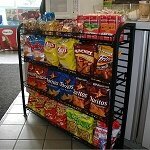 When you place this snack rack in your store you are sure to increase those impulse buys. 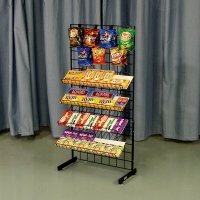 Use the metal black display rack for candy or chips or any variety of snacks. Whatever you decide to use the metal candy rack for customers will notice and who can pass up a tasty treat. Let the profits start. Order your grocery store display rack today!